Considering all included features and technicalities, HostPapa is a great choice for a blog, a start-up project or a small online shop. 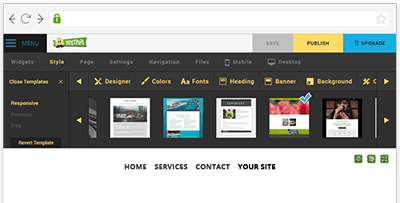 Multiple ready-to-use tools and the website builder would help you to launch your presence on the web in no time. HostPapa sport a very green looking website and that comes down to the reason that they focus heavily on providing a greener service for their customers. They do this by buying wind power credits for each watt of energy used by the company, and they were actually the first company out there to start doing this. Since then more companies have joined the line. They are a US and Canadian based setup, offering great prices for small to mid-sized companies, with CPanel at hand and plenty of extra features to help build, maintain and market your website. 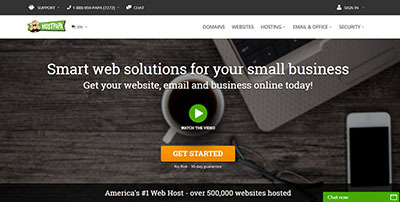 HostPapa supports more than 500,000 small businesses and personal websites. At a starting price of $3.95 per month, which includes unlimited “almost everything” and great customer service, HostPapa is worth checking out. Want to know if HostPapa is right for you? HostPapa offers quite a few features. They also focus on tools for small business like blogs and small eCommerce projects. Also, there’s a whole section dedicated to Google Apps (spreadsheets, Google Docs, etc.) that can be purchased. The technical details of HostPapa plan are quite attractive. You get unlimited MySQL 5.1 databases, unlimited domains and subdomains, zero limit for email accounts, and a marketing package with free credits for 5+ promo tools. And don’t forget that it’s all green and costs quite an affordable price. You cant get much better than the uptime guarantee at HostPapa as the HostPapa.com site runs at 99.98% whilst they provide 99.9% for all customers on all plans that they currently offer. The excellent uptime stats come from the level of technology and the systems that they have in place, which include UPS power backup, firewall and 24/7 monitoring systems to keep tabs on stability. If that’s not all, they have a high security setup with actual uniformed guards patrolling the data center to make sure no breach ever takes place. A level of security that most hosting companies cannot say they offer. HostPapa enjoys an impeccable reputation in technical expertise, reliability, security and customer support. The HostPapa site is well designed and frequently updated. There is plenty of company information, as well as a regular, active blog. Signing up and choosing a plan is easy, and all of the features included are clearly listed. You do not need to know HTML or have design experience to utilize the drag-and-drop interface, which allows you to customize your website’s look relatively quickly, as well as add pre-made widgets and functions to enhance your site. HostPapa uses the industry-standard cPanel, which is easy-to-use and configurable for most users. Since so many products are included in the package, you will find more functionality in your HostPapa’s panel than in that of other hosting companies. HostPapa has a very extensive help section, with a specially branded video for practically everything – you never feel like it’s generic info. 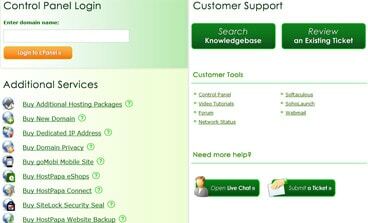 You can call or chat 24/7 as well as email or delve into their extensive user forum area. If you have a problem, chances are it’s discussed in the forum or knowledge base, and human help is also quickly accessed. Since it’s an international company, articles are also in French and Spanish. This is where HostPapa loses a few points. True, its prices are competitive, especially for what they offer in terms of features and support. But practices such as pre-selecting add-ons at check out (such as a Private Domain and SiteLock security plans), or domain prolongation after 1 free year, are not cool. To get a dedicated IP, you have to dig around to find out that it costs an additional $36/yr (as of Novermber 2017). To unsatisfied customers’ disappointment, the free setup that is waived is actually charged you cancel your subscription, in spite of the “Money Back Guarantee” that can be claimed within 30 days. Still, in spite of these annoyances, they offer a good deal for what you get – as long as you understand what it is you are getting. onClick="trackClickout('event', 'clickout', 'Vendor Page - Visit User Reviews', 'Hostpapa', this, true);"
I've had a great overall experience with this host and their customer service team. Although they don't offer 24/7 telephone support, they do offer 24/7 support online and through live chat which is great! Their services and uptime are superb and meet the needs of my business, and I wouldn't hesitate to recommend them. HostPapa strives to give you great service for your money. They are easy to get in touch with and forthcoming to help. Aside from a few disingenuous sales tactics, they do offer quite a bit for the price. So even if you buy a plan with a three year option, the odds are, you will maintain your website for some time. Like HostPapa Review? Visit HostPapa. Wondering how Hostpapa stacks up against other Web Hosting companies? Enter any other Web Hosting company and we will give you a side-by-side comparison.